Glass Partitions can be quite expensive, but the trade-off is a clean, modern material that diffuses natural light and helps contain sound. Custom etching the glass partitions, has been done here, can alter the degree to which one feels connected to or separated from the adjacent spaces. A compelling solution for spatial planning that is flexible, efficient and visually arresting. 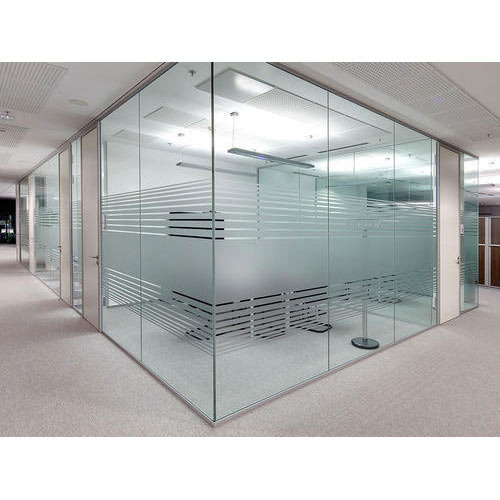 DORMA glass partitions systems enable layouts tailored to the given applications. Operated manually, Horizontal Sliding Walls allow rooms to be merged or divided with ease. With a variety of components, these flexible systems also ensure security room division. Wherever elegant transitions,the glass partitions are required from one room to another and where the emphasis is on transparency in the open-plan design of living and working environments, glass partitions are fully glazed wall partitions and dividers provide an ideal incentive for architectural excellence. Founded in the year 2015, "Galaxy Interior & Exteriors " is a prominent organization of this domain passionately engaged in manufacturing and trading a quality approved array of Interior and Exterior Products. These products are manufactured by utilizing finest grade basic material in accordance with the industry defined parameters and norms. Our offered products are highly appreciated and demanded by our client base for their excellent finish and sturdy designs. In our wide assortment of product we are presenting optimum quality Structural Glazing, Stick Glazing and ACP Cladding. To suit the varied demands of our client base, we are offering these products in various stipulations. Apart from this, one can avail these products from us at industry leading price. We have constructed a highly advanced infrastructure unit at our premise over a vast area of land. Our facility is equipped with the latest machines and tools to fabricate our offering as per the industry approved norms and standards. To handle our business operations in an efficient manner, we are supported by a team of skilled and talented professionals. We have appointed these professionals on the basis of their knowledge, working experiences and educational ability. We have carved a huge client base across the nation.